Summary: Researchers have developed nanowires that can record the electrical activity of neurons in fine detail. The technology will allow for better investigation as to how the brain works. 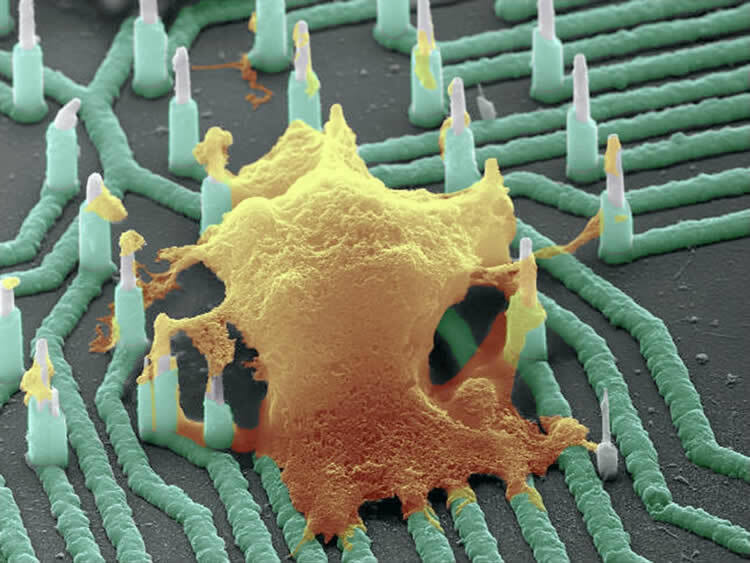 This is a colorized SEM image of a neuron (orange) interfaced with the nanowire array. NeuroscienceNews.com image is credited to Integrated Electronics and Biointerfaces Laboratory, UC San Diego. A patent is pending for this technology. Funding: This work was supported by a National Science Foundation CAREER award (ECCS-1351980). The team also acknowledges support from the Center for Brain Activity Mapping at UC San Diego, a Calit2 Strategic Research Opportunities award (CITD137) from the Qualcomm Institute at UC San Diego, a Laboratory Directed Research and Development Exploratory Research Award (LDRD-ER) from Los Alamos National Laboratory, the National Institutes of Health (R21 MH099082), a March of Dimes award and a UC San Diego Frontiers of Innovation Scholar Program award. This work was performed in part at UC San Diego’s Nanotechnology Infrastructure, a member of the National Nanotechnology Coordinated Infrastructure, which is supported by the National Science Foundation (grant ECCS-1542148). Image Source: NeuroscienceNews.com image is credited to Integrated Electronics and Biointerfaces Laboratory, UC San Diego. UCSD “‘Neuron-Reading’ Nanowires Could Accelerate Development of Drugs for Neurological Diseases.” NeuroscienceNews. NeuroscienceNews, 11 April 2017. UCSD “‘Neuron-Reading’ Nanowires Could Accelerate Development of Drugs for Neurological Diseases.” http://neurosciencenews.com/nanowires-neurology-neurons-6388/ (accessed April 11, 2017).